When companies talk about cloud computing, the benefits that immediately come up are cost efficiency, agility and scalability. But cloud infrastructure management does more than that. It not only speeds up application development but also encourages innovation and transforms the business culture, says Mai-Lan Tomsen Bukovec, vice-president and general manager of Amazon S3, a web service offered by Amazon Web Services (AWS). Nick Walton, managing director for Asean at AWS, says cloud offerings address the issue of overcapacity as businesses are able to match their capacity with the spikes in customer demand. When the capacity is no longer necessary, they may spin it back down and stop paying for it. Walton points out that in the old world of on-premise infrastructure, the required capacity size has to be estimated and if a business errs on the side of caution, it ends up buying more than it needs and could be bogged down by the infrastructure. “But let’s say you have a very successful marketing campaign and the demand and traffic to your website increase. If you are not able to meet that capacity requirement, you end up with dissatisfied customers, which is counterproductive to your marketing activity,” he adds. Bukovec says once businesses get started, however, they realise that the real benefit of cloud computing is that it shortens the time to market. For instance, Thailand’s stock exchange, which serves about 100,000 customers during peak periods, rebuilt its whole online trading system on the AWS platform and saved up to 30% in infrastructure costs. “But the real value was being able to deliver the whole online infrastructure in just eight months. This is a story we hear over and over again and it does not matter which customer or region,” says Bukovec. Bukovec says small and medium enterprises (SMEs) usually start adopting cloud computing by migrating their websites to the AWS platform. Over time, they move other workloads such as data processing. “Raw storage and backup are other common scenarios and the SMEs [that migrate to the AWS platform] will immediately have access to the strongest security tools. This may not have been possible or economical if they managed it themselves,” she says. Walton says AWS customers’ content and security requirements have been central to how the web service provider thinks about delivering its offerings. He points out that historically, encryption has been a complicated process, but AWS has a rich set of tools that make it much simpler. “So, customer content and data are owned and controlled exclusively by them and they provide control over who has access to the content and data. We do not have access to the data. 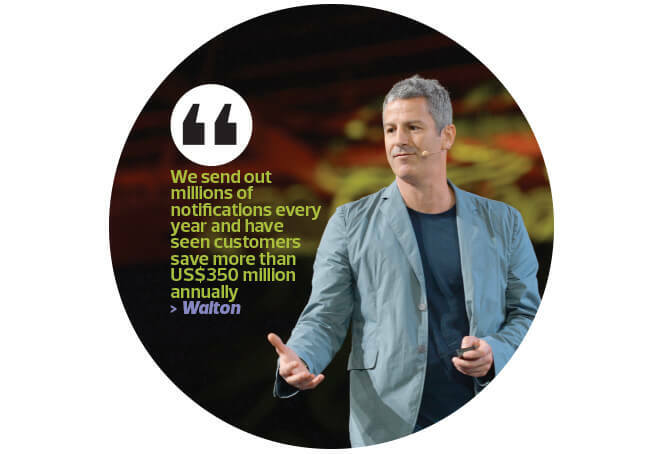 That is a key part of how we build trust with large enterprises that store and run critical applications on AWS today,” says Walton. In her keynote speech at the Amazon Web Services Summit in Singapore last month, Bukovec said “builders” are all over organisations. It is no longer just the developers but also business and operations people as well as senior leaders. “No longer can you expect that the only input to your applications is through a keyboard or mouse. Now, you have different types of input, ranging from voice to data sensors, with data streaming in from Internet of Things devices. Connectivity is everywhere,” she told the 6,000 participants at the summit. This means enterprises that leverage cloud computing have to iterate very quickly, she pointed out, adding that it is no longer okay to do a deployment (of functions in applications) once a week or once a month. Deployments are now happening 10 to 50 times a day. “You have to deploy at this speed to keep changing your customer application because today, user context is everything. The user experience is personalised, customised and deeply embedded in the users’ world, and your application has to understand that,” said Bukovec. She notes during the interview that one of the trends in cloud infrastructure or architecture revolves around data and points out that the two aspects of data usage — insights and analytics — can be done through machine learning (ML) capabilities. “We have a lot of ML going on at Amazon. And if you have billions of orders coming in, an application or a human being will find it very hard to go through every single one of them to identify the characteristics and patterns of the customers. So, ML is an incredibly useful technology and Amazon has been using it for 25 years,” says Bukovec. She notes that targeted advertising is commonly done on AWS as it requires an incredible amount of computing capability. The visual heavy Pinterest, for example, uses ML tools on AWS to help classify the images. “We have a customer in Southeast Asia called Shoppr, which analyses about 100 million images on social media every day and makes inferences based on which fashion brands are showing up in these images. It shares the data with the fashion brands themselves and makes recommendations,” says Bukovec.